On and off for months I’ve thought about doing a 30 before 30 kind of list. Just the fact that I have come back to it so many times has taught me that it is time to just commit to it and go for it! And really, I turn 30 at the end of just 3 months from today, so no better time to start, right?! Of course, I saw this somewhere. Multiple blogs and websites for sure. But I have no clue where. 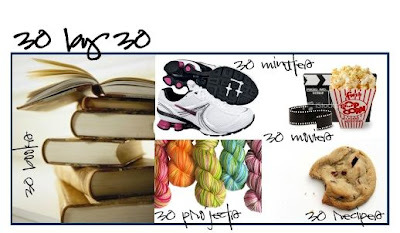 So rather than look to see what others have done or find what I saw before, I’m going to do my own thing with this: A moving, flexible, adaptable 30 by 30 list. In my mind, I look these lofty lists I’ve seen of backpacking through Europe, Skydiving, reading the BBC top 100 list. Me? I think these are great, but I would much rather focus on the here and now. The things that are staring me right in the face that I want to spend my time on today. That I can accomplish in 3 months. Aside from that lofty ever growing and changing list of things to do someday, here’s my idea of a 30 by 30 that I want to accomplish by my birthday on February 28th, 2010! 1. Read 30 books by 30. I seriously have a HUGE collection of books I want to read. I even have a stack of loaned books that have been sitting in my living room for over a year now. So that pile of books is where I intend to start. 2. Finish 30 projects by 30. I have a never ending list of projects. The to-do list just seems to grow and never seems to get smaller. Small projects, time consuming projects, annual projects. Even if that list continues to grow I want to finish 30 projects by 30. 3. Watch 30 movies by 30. Our Netflix queue is out of control. Hundreds of movies. Time to catch up a little. We’re on a roll right now and I want to at least get our $'s worth out of Netflix again! 4. Cook 30 new recipes by 30. No other rules here, just to try 30 new things. Anything really. I just want to spend more time cooking and baking. Already have a few in mind! 5. Run 30 by 30. And by 30 I mean a 30 minute 5k. Totally doable, but a commitment to getting back into running 3-5 days a week. I was close to running this time once by a few minutes. I am a better runner now than I was then. I’m mentally tougher now and have endurance now that I didn't then. So how will this all work? Right now I look at it as three months, 30 items on those four lists and one goal. Just ten a month... ten books, ten recipes, ten movies, ten projects. Check in at least once a week, start building those four lists of items done. As for the running goal, I will go back to my old program I liked so well, the ten weeks to run a 5k. Want to keep my evening class workouts of aerobics, kickboxing and the occasional boot camp... maybe even toss in the occasional bike ride with my husband, but I think I will be getting up the morning to run again. All I need is my iTunes play lists and some sleep. Do you have any lists of things waiting out there for you to do? What helps you stay motivated? Have you finished any of those lists? What a great idea! I cannot believe how fast 30 is creeping up on us. I swear, I just need to jump on the treadmill and set myself a new goal. And seriously, you must be a power reader- ten books in a month...good luck with that. Great Idea! Good luck with it! I will be pulling for you! I will be 30 in April! I totally hope you meet all of your goals! You can do it!!! I loved reading all of your recipe entries on your blog. Really neat how you adapt them to what you want to do!